In an elegant Old Town building dating back to the late 1800s, this trendy hotel is 12 minutes' walk from a metro station and 3 km from grand Dolmabahçe Palace, which is on the coastline of the Bosphorus strait. 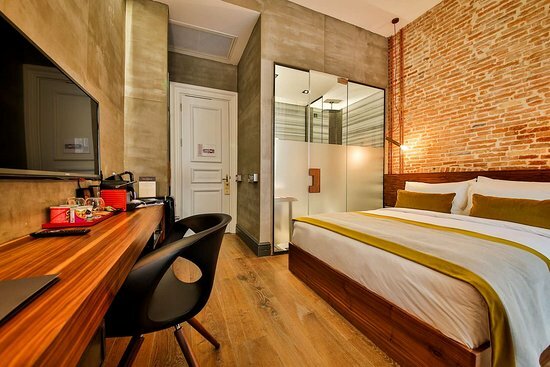 Featuring exposed redbrick walls, quirky rooms come with free Wi-Fi and flat-screens, as well as tea and coffeemaking facilities that include Nespresso machines. Some offer floor-to-ceiling windows; some have balconies or terraces with water views. Some suites feature living areas, plus arty murals and frescoes. Room service is 24/7. Breakfast is available in a restaurant that has a garden, and there's a cool bar.